The Lee County Library has joined with The ACMA (Americana Community Music Association), to offer free Acoustic concerts of all original music. Concerts will take place in the Amphitheater, which is located on South Cornog Plaza. Bring a chair or a blanket, shows will be moved indoors depending on weather. 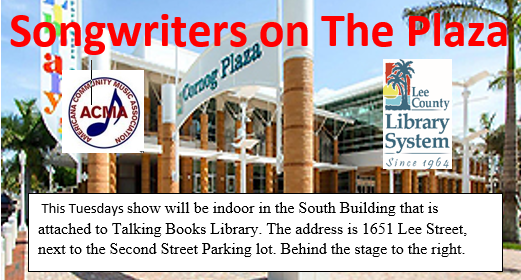 This show will be indoor in the South Building that is attached to Talking Books Library. The address is 1651 Lee Street, next to the Second Street Parking lot. The ACMA is a Fort Myers based not for profit that promotes local artists who perform their own original songs. Come hear great original music and the stories behind the songs in an intimate Songwriters Showcase. Be prepared to enjoy an evening of professional quality acoustic Americana music. Americana music a coming together of blues, roots, folk and country. Kim Mayfield started playing music on the family piano at age nine. She studied with several teachers on and off for about thirty years before learning to play with others. As half of the duo “Reckless Saints” Kim has picked up guitar, mandolin, and songwriting, as well as learning to play keyboard without “notes.” She is in her tenth year of touring nationally and internationally with her husband and duo partner Roy Schneider, and once more getting used to playing alone. Andy Getch is a local artist who has written hundreds of songs and also paints. Andy is very active in the Fort Myers area.